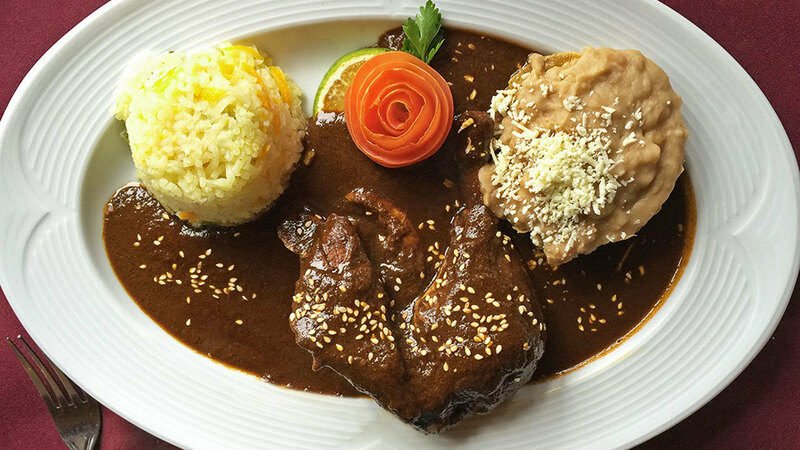 You eat Mexican food like it’s your job all year round, so why not incorporate your love for the cuisine into this year’s Thanksgiving feast? There’s no need to ditch Turkey Day classics to serve up an amazing dinner with a touch of ethnic flair. All it takes is a little bit of spice (and a whole lot of flavor) to put together a Mexican Thanksgiving that everyone will beg you to make again next year. 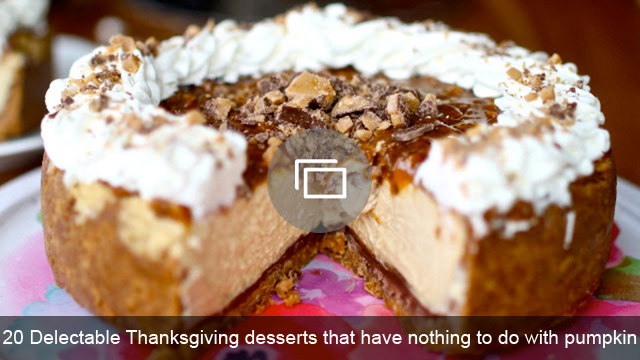 Try these Mexican-inspired Thanksgiving recipes to spice up your holiday table. Turn oven to broil and place poblanos on a small baking sheet. Place in the oven and cook, turning occasionally, until the skins of the peppers are charred. Transfer to a paper bag, close, and set aside for skins to steam loose. Cut one orange into wedges and set aside. With the second orange, grate orange zest into a food processor, cut orange in half, and squeeze juice into food processor. Turn oven to 450 degrees F. Peel skin from the poblanos and transfer them to the food processor. Add chipotle, garlic, oil, honey, salt, pepper, oregano, cumin and coriander. Process until smooth. Wash turkey and trim off excess fat. Place turkey breast side up in a roasting pan on a roasting rack. Slip your fingers underneath the skin at the breast to separate the skin from the flesh. Rub pepper paste underneath skin onto the flesh. Stuff orange and onion wedges underneath the skin and inside the cavity of the turkey. Cover turkey and roasting pan in foil and roast for 30 minutes. Reduce oven heat to 325 degrees F. and continue to roast for 2-1/2 hours. 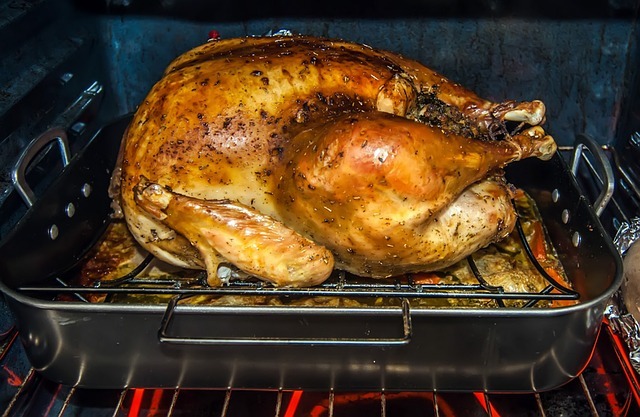 Remove foil and continue to roast for 30 minutes or until an instant read thermometer inserted in a thigh (but not touching the bone) registers 165 degrees F.
Let turkey sit for 15 minutes before carving. You can’t go wrong with chiles and cheese. This casserole may just become a year-round side dish on your dinner table when you’re serving Mexican fare. Preheat oven to 325 degrees F. and grease a 10-inch round baking dish. 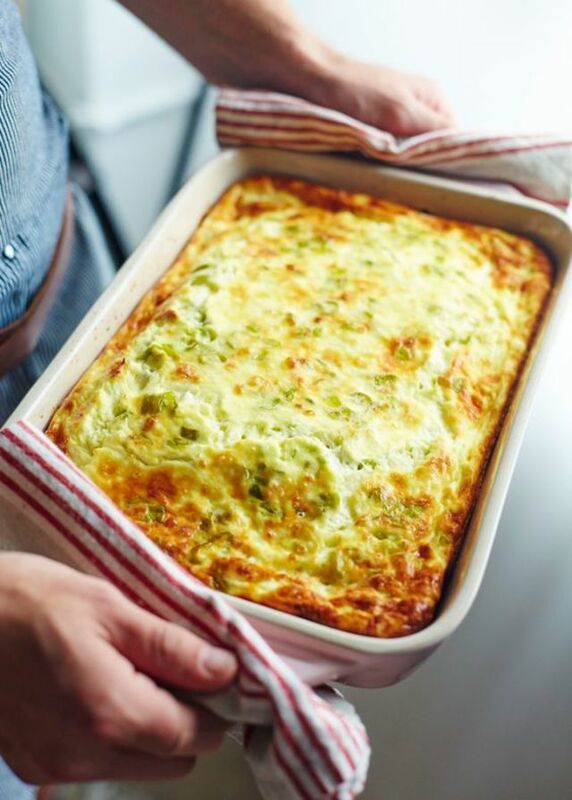 Layer cheese and chiles in the prepared baking dish. In a large bowl, whisk together Bisquick, eggs and milk. Season with pepper. Pour liquid mixture over cheese mixture and shake dish to distribute liquid. Bake for 45 minutes or until the top is golden brown and filling has set. 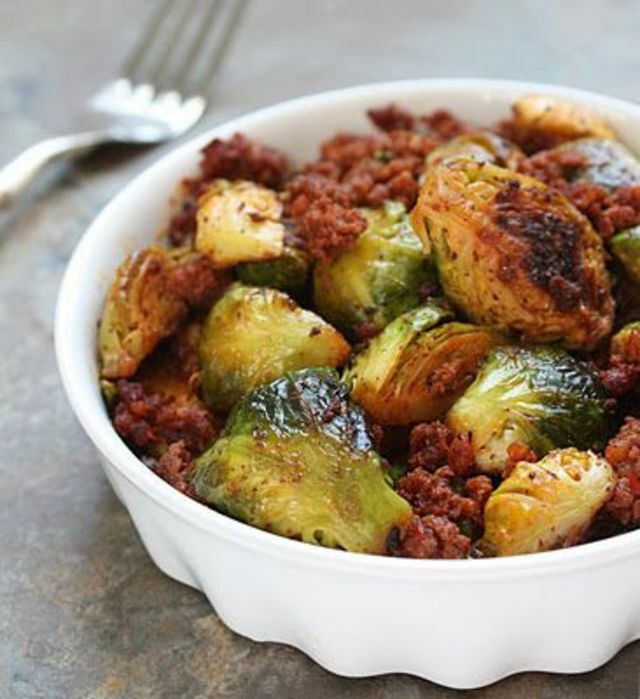 Instead of bacon, give your Brussels sprouts a spicy Mexican flair with chorizo. Cook Brussels sprouts in a large pot of salted boiling water until they are just tender. Drain and dunk in a large bowl of ice water to halt cooking. Drain and set aside on paper towels to dry. Heat one tablespoon of the oil in a large skillet over medium heat. Add chorizo and cook, stirring occasionally, for three to four minutes. Add onions to the skillet and cook, stirring often, until onions are lightly browned. Transfer chorizo mixture to a large bowl. Increase heat to medium-high and add the remaining oil. Add Brussels sprouts and cook, stirring occasionally, until the Brussels sprouts are lightly browned. Stir chorizo mixture into the Brussels sprouts and then transfer to a serving platter. Garnish with crumbled cheese. 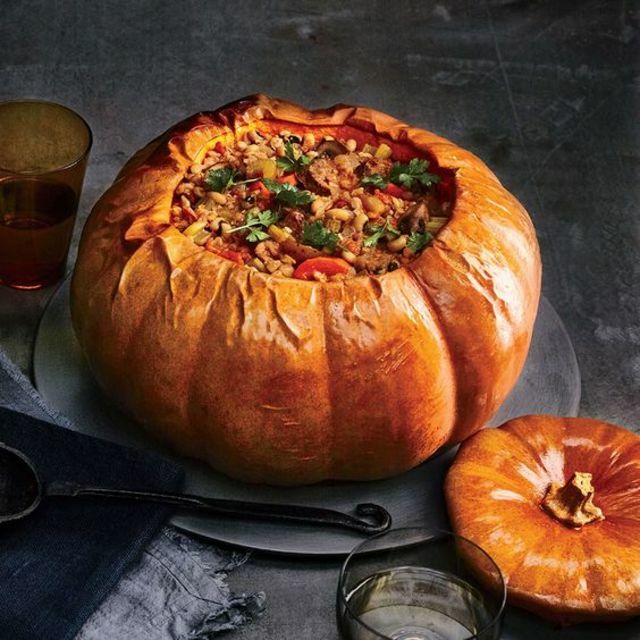 Stuffed pumpkins make a stunning presentation for Thanksgiving. You can fill them with your favorite Mexican rice recipe, or save yourself some time and try the Nueva Cocina Mexican Rice Mix. Ready in 25 minutes and packed with flavor, you’ll find yourself making this rice year-round. Even better, the brand is 100 percent natural, free of MSG and lower in sodium than most other brands. Preheat oven to 350 degrees F. and spray two rimmed baking sheets with cooking spray. Cut all the pumpkins in half, leaving the rind on. Remove the seeds and strings. Rub the pumpkins with olive oil and season the flesh with salt and pepper. Place pumpkin halves on baking sheets with rind side up and pour a small amount of water in the baking sheets. Bake for 45 minutes or until pumpkins are tender. Meanwhile, prepare rice mix according to package directions. While the rice is cooking, peel one of the pumpkins and dice the flesh. Stir the pumpkin cubes into the rice when it’s finished. To serve, set the remaining pumpkin halves flesh-side up then fill with rice mixture. 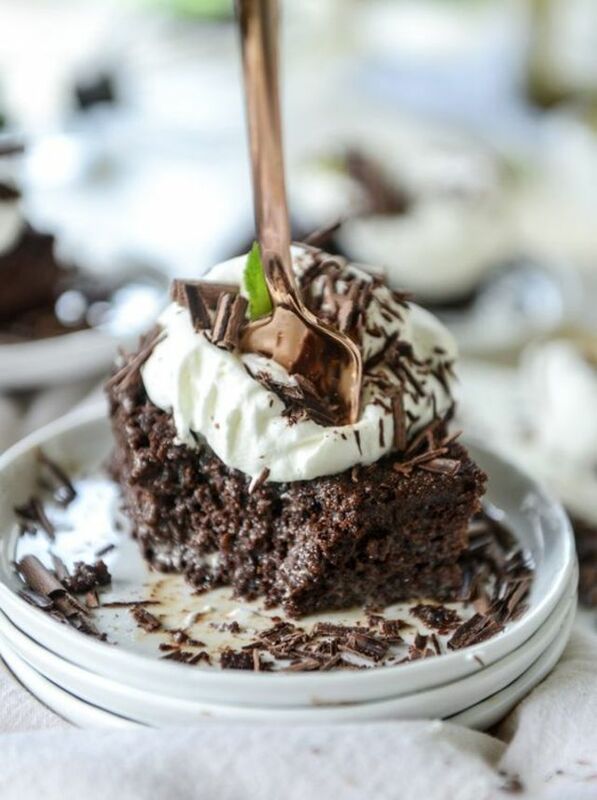 If pumpkin is part of the savory Thanksgiving meal, serve this rich chocolate “tres leches” cake for Thanksgiving dessert. Preheat oven to 325 degrees F. and grease an 11 x 7-inch baking dish. In the bowl of a standup mixer fitted with the whisk attachment, beat eggs until they have thickened and lightened in color. Gradually add sugar and continue to beat until eggs have tripled in volume. In a small bowl, whisk together flour and cocoa. Fold flour mixture into egg mixture, taking care not to deflate the egg mixture. Pour batter into the prepared baking dish. Bake for 45 minutes or until a toothpick inserted in the center comes out clean. Set baking dish on a wire rack to cool. Using a skewer, pierce the top of the cake all over. In a medium saucepan over medium-high heat, stir together evaporated milk, condensed milk and cream. Bring to a boil, remove from heat, and stir in chocolate until it is melted and mixture is smooth. Stir in crème de cacao. Pour milk mixture over cake. Cover and refrigerate until liquid is completely absorbed, at least two hours. When ready to serve, reheat cake in the oven at 325 degrees F. Serve with ice cream or whipped cream.